The LogTag® low temperature external probe recorder measures and stores up to 8000 temperature readings over a measurement range of -80°C to +40°C (-112°F to +104°F) using interchangeable LogTag® ST10 External Temperature Probes. Intended for use in monitoring of articles stored at low temperatures such as in dry ice type environments. Using the LogTag® Interface Cradle and the freely available companion software LogTag® Analyzer, the LogTag® TREL-8 is easily set-up for recording conditions including delayed start, sampling interval, number of readings, continuous or fixed number of readings and configuration of conditions to activate the 'ALERT' indicator. 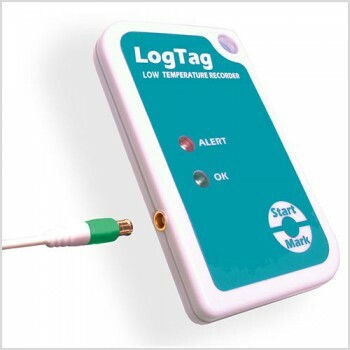 The LogTag® TREL-8 requires the ST10 External Temperature Probe to function correctly. The ST10 probe is uniquely suitable for external low temperature monitoring and is FDA food rated made of high quality materials. Click here to view the ST10 External Temperature Probe. LogTags® unique interface cradle design provides rapid and reliable data transfer to LogTag® Analyzer software in a matter of seconds. By far the fastest in its class. Click here for Interface Cradle details. The LogTag® Wall Mount Bracket provides an easy and tidy solution to mounting a LogTag® on a wall, door or vertical surface while still allowing easy removal of the LogTag® for inspection or download. Click here for Wall Mount Bracket details. Get access to our free software which you can use with the TREL-8 device.